Who says only modern-day pro wrestling is fake? Researchers have deciphered a Greek document that shows an ancient wrestling match was fixed. The document, which has a date on it that corresponds to the year A.D. 267, is a contract between two teenagers who had reached the final bout of a prestigious series of games in Egypt. 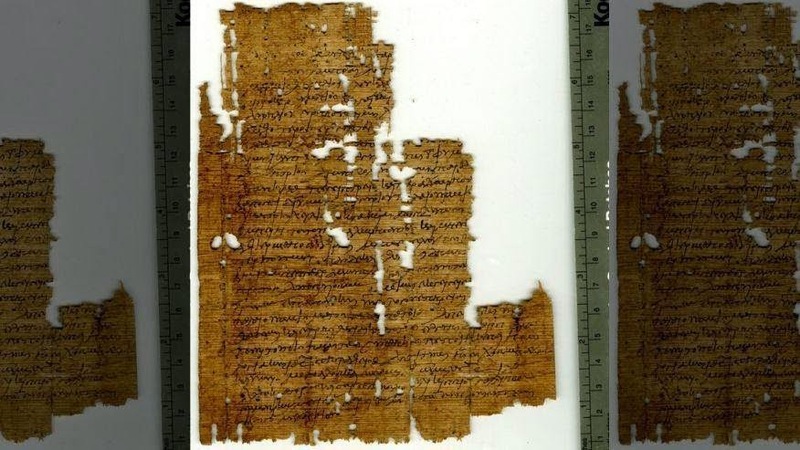 This is the first time that a written contract between two athletes to fix a match has been found from the ancient world. In the contract, the father of a wrestler named Nicantinous agrees to pay a bribe to the guarantors (likely the trainers) of another wrestler named Demetrius. Both wrestlers were set to compete in the final wrestling match of the 138th Great Antinoeia, an important series of regional games held along with a religious festival in Antinopolis, in Egypt. They were in the boys' division, which was generally reserved for teenagers. The contract stipulates that Demetrius "when competing in the competition for the boy [wrestlers], to fall three times and yield," and in return would receive "three thousand eight hundred drachmas of silver of old coinage "
There were no pins in this Greek style of wrestling, and the goal of the wrestlers was to throw the other to the ground three times. A wide array of holds and throws were used, a few of which look a bit like a body slam. The contract includes a clause that Demetrius is still to be paid if the judges realize the match is fixed and refuse to reward Nicantinous the win. If "the crown is reserved as sacred, (we) are not to institute proceedings against him about these things," the contract reads. It also says that if Demetrius reneges on the deal, and wins the match anyway, then "you are of necessity to pay as penalty to my [same] son on account of wrongdoing three talents of silver of old coinage without any delay or inventive argument." The translator of the text, Dominic Rathbone, a professor at King's College London, noted that 3,800 drachma was a relatively small amount of money about enough to buy a donkey, according to another papyrus. Moreover, the large sum Demetrius would forfeit if he were to back out of the deal suggests his trainers would have been paid additional money Rathbone said. The match fixing took place at an event honoring Antinous, the deceased male lover of the Emperor Hadrian (reign A.D. 117-138). After Antinous drowned in the Nile River nearby, the town of Antinopolis was founded in his honor, and he became a god, and statues of him were found throughout the Roman Empire. The games had been going on for more than a century by the time this contract was created, and brought benefits for the people of Antinopolis. For instance, "You get the visitors; you get the crowd; you get the trade; you get the prestige," Rathbone told Live Science. The contract was found at Oxyrhynchus, in Egypt, more than a century ago by an expedition led by archaeologists Bernard Grenfell and Arthur Hunt. It was translated for the first time by Rathbone and published in the most recent volume of The Oxyrhynchus Papyri, an ongoing series that publishes papyri from this site. The transcription of the text was done by John Rea, a now-retired lecturer at the University of Oxford and Rathbone did the translation. The Egypt Exploration Society owns more than 500,000 papyrus fragments from this site, and they are now kept at the Sackler Library at Oxford.